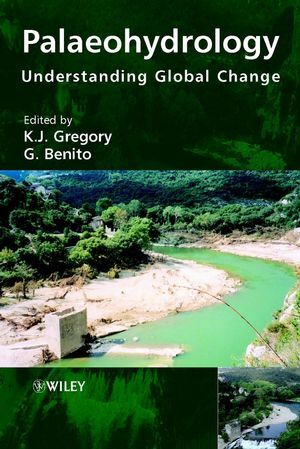 K. J. Gregory is the editor of Palaeohydrology: Understanding Global Change, published by Wiley. G. Benito is the editor of Palaeohydrology: Understanding Global Change, published by Wiley. Chapter 1. Potential of Palaeohydrology in Relation to Global Change (K.J. Gregory & G. Benito). Chapter 2. INQUA Research and Palaeohydrology (L. Starkel). Chapter 3. Palaeohydrology and International Global Change Programs (K. Alverson & T. Edwards). Chapter 4. Introduction to Regional Palaeohydrologic Regimes and Areas (K.J. Gregory & G. Benito). Chapter 5. High-latitude Fluvial Morphology: The Example from the Usa River, Northern Russia (J. Vandenberghe & M. Huisink). Chapter 6. The Lateglacial and Holocene Palaeohydrology of Northern Eurasia (A. Sidorchuk, et al.). Chapter 7. Palaeohydrology of Central Europe (L. Starkel). Chapter 8. Global Environmental Change and the Palaeohydrology of Western Europe: A Review (A.G. Brown). Chapter 9. Palaeohydrological Changes in the Mediterranean Region during the Late Quaternary (G. Benito). Chapter 10. North American Palaeofloods and Future Floods: Responses to Climatic Change (J.C. Knox). Chapter 11. Palaeohydrological Reconstructions for Tropical Africa since the Last Glacial Maximum – Evidence and Problems (M. F. Thomas & M. B. Thorp). Chapter 12. The Late-Quaternary Palaeohydrology of Large South American Fluvial Systems (E.M. Latrubesse). Chapter 13. Late Pleistocene–Holocene Palaeohydrology of Monsoon Asia (V. Kale, et al.). Chapter 14. Alluvial Evidence of Major Late-Quaternary Climate and Flow-regime Changes on the Coastal Rivers of New South Wales, Australia (G. Nanson, et al.). PART 4: RECENT PROGRESS INTERPRETING EVIDENCE OF ENVIRONMENTAL CHANGE. Chapter 15. Data Sharing in Palaeohydrology: Changing Perspectives (T. Oguchi, et al.). Chapter 16. Fluvial Morphology and Sediments: Archives of Past Fluvial System Response to Global Change (D. Maddy, et al.). Chapter 17. Palaeohydrological Modelling: from Palaeohydraulics to Palaeohydrology (J. Thornes). Chapter 18. Palaeofloods and Extended Discharge Records (V. Baker). Chapter 19. Palaeohydraulics of Extreme Flood Events: Reality and Myth (P. Carling, et al.). Chapter 20. Short-term Hydrological Changes (L. Starkel). Chapter 21. Palaeohydrology, Environmental Change and River-channel Management (K. Gregory). Chapter 22. Concluding Perspective ( K. Gregory & G. Benito). Appendix: Discussion at the Fifth International Meeting of GLOCOPH in Pune, India, December 2002.